On July 21 Dusty turns 15! He’s my guard dog and companion, and has been pals to all the other critters that we’ve had in our house over the years. And he’s so darn cute! Dusty likes to guard with a toy nearby. 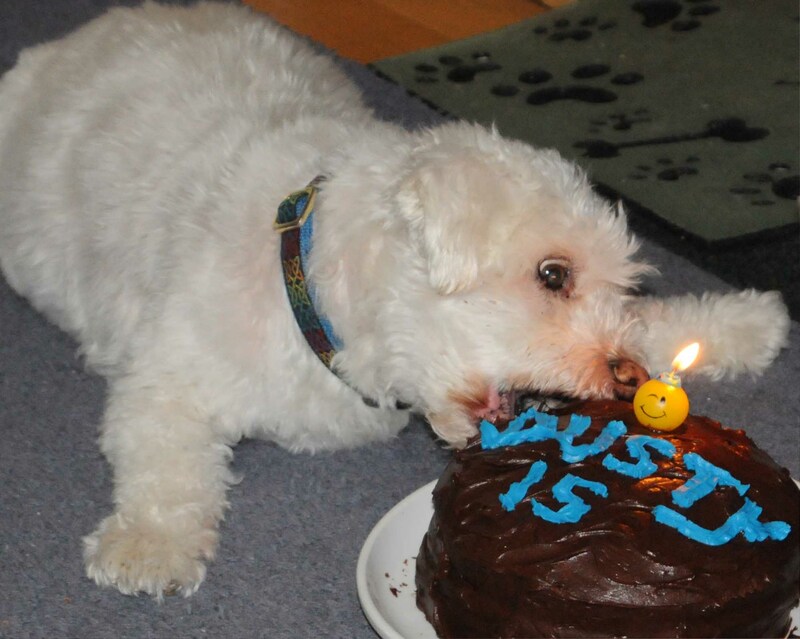 In honor of Dusty’s 15th birthday, we not only made a birthday cake . . .
No sense waiting for the candle to be blown out!
. . . we also decided to offer free downloads of Dusty, the Angel Pup, a rhyming photo e-book about Dusty and told from Dusty’s perspective. Just go to Smashwords.com, click on Dusty’s book, ADD TO CART and use the coupon code XU89L. This offer is good through the end of July, 2013. In return, I’d appreciate it if people would comment about the book on Smashwords and Amazon. 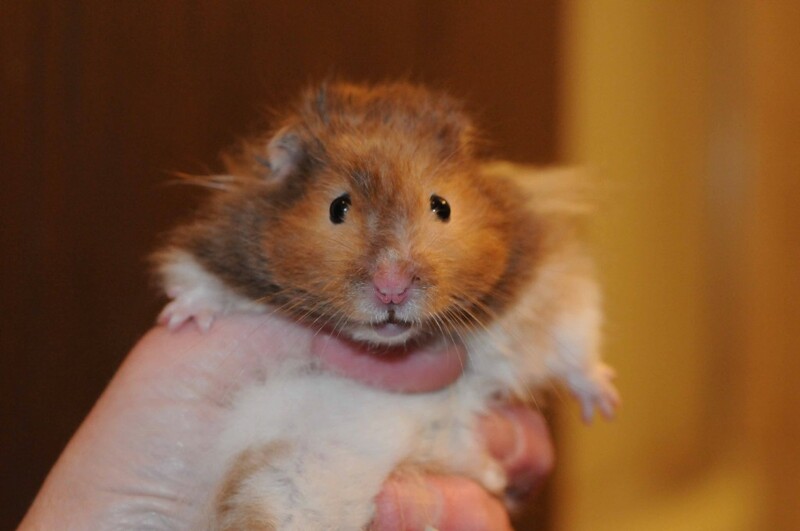 And while you’re there, you might also check out my three other photo e-books and Something Furry Underfoot, my humorous, touching memoir about the dozens of pets that we raised over 18 years: ferrets, hedgehogs, mynah birds, hamsters, two dogs, a cat, a rabbit and more! 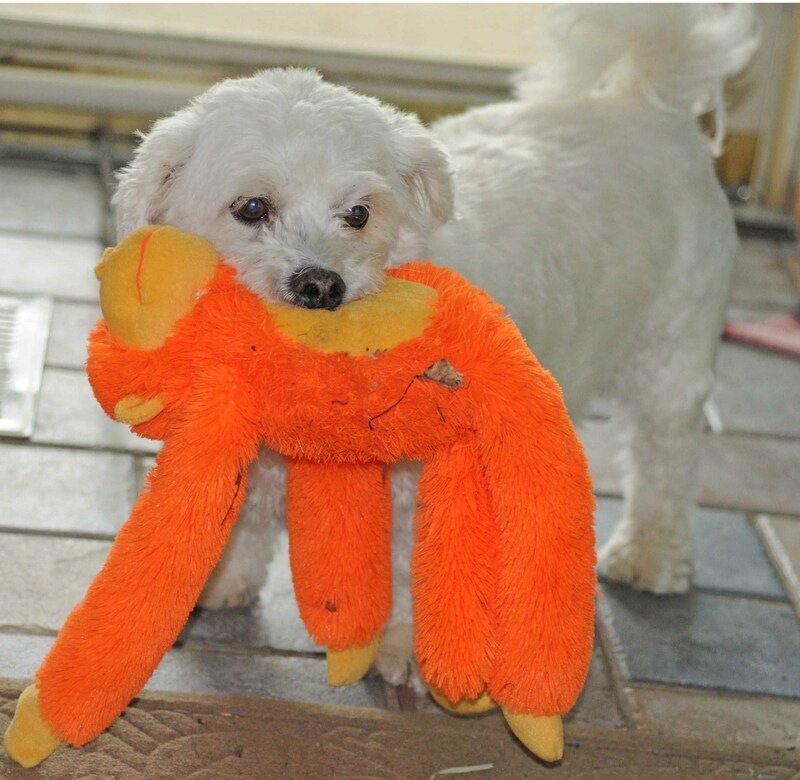 Some proceeds for all my animal books will support animal rescue organizations. Thanks for helping us celebrate Dusty’s birthday! Mark and I have placed many wooden nest boxes around our small yard in the hopes that birds or squirrels will take up residence. 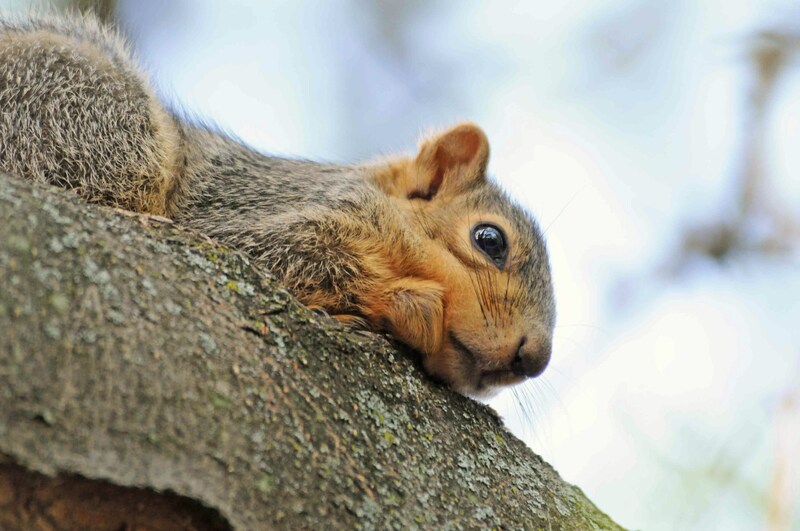 We’ve witnessed enough squirrels over the years that we know a mother squirrel keeps her babies in their nests–or in our case, wooden nest boxes–until the babies are about 3/4 the size of the parents. Unbeknownst to us, a mother fox squirrel and her two babies had made a box in our front yard their home. May 16 was the first time I saw one of the babies. Squirrel part way in, part way out of the nest box in our front yard. Nearby was the squirrel’s sibling. 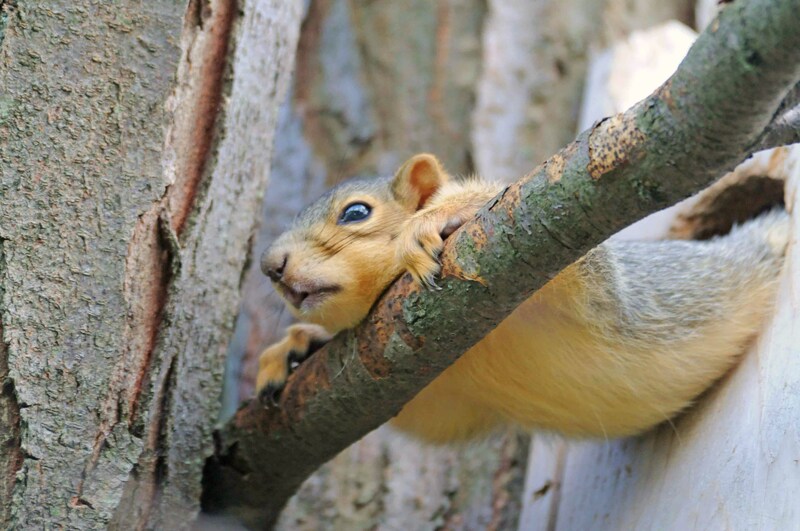 Sibling of the first squirrel I saw, already exploring the tree. 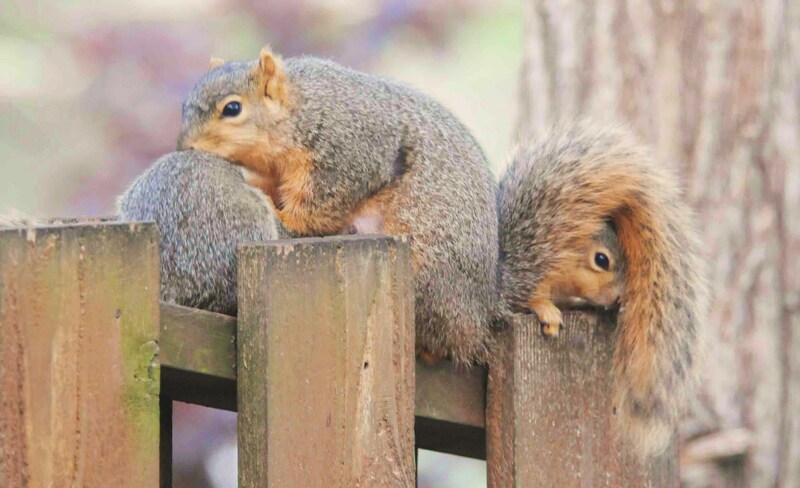 We guessed that the mother of these two squirrels was one of the ones we’d seen stuffing her face on the mountains of sunflower seeds we pile on our deck for birds and squirrels. And sure enough, the next day, we saw the mother squirrel guide her babies out of the box, up the tree, onto our roof, and onto the fence on the one side of our deck. 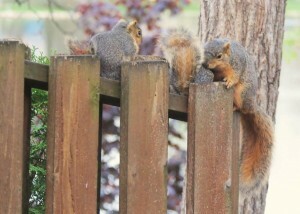 Mother squirrel with her two babies on the deck fence. Since we’d seen the mother squirrel enjoying our sunflower seeds, we suspected she was showing the babies where they would always find food. She climbed onto the deck, and, when the babies didn’t immediately join her, she went back up to reassure them. 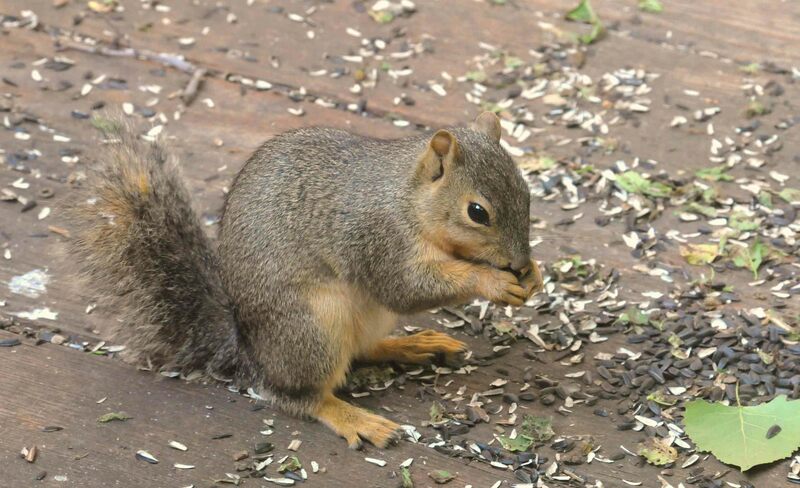 After touching both of them, she returned to the deck, ate some sunflower seeds and waited. I watched both babies for several minutes and noticed the one on the left seemed to start shaking or shivering. The mom noticed, too, and ran back up the fence. It was only after I snapped this photo that I saw the baby on the left was missing part of its tail. Mom returns to check on her babies. The mom reassured the first baby, then turned her attention to the one with the chopped off tail. She licked his wounded tail and then put her arms around him to comfort him, to get him warm? Mom wrapping her arms around her baby. We watched a moment longer and realized the same baby with the wounded tail also was holding up its right front paw, as if it, too, was injured. 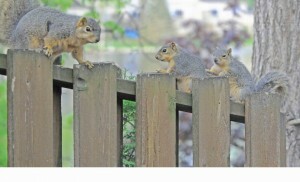 Shortly after I took the above photo, the mom led her two charges back up the fence and to the roof. The healthy baby leaped and hopped along, while the wounded baby walked carefully, slowly, stumbled a bit, and barely put weight on his front right paw. 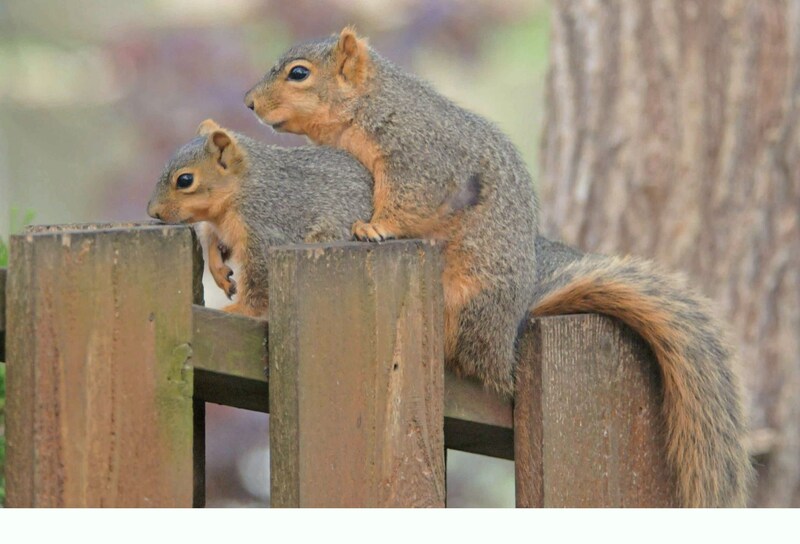 For days afterwards, we didn’t see any baby fox squirrels outside our front yard; we did see one on our deck, and it was the healthy baby with the healthy tail. Days went by as we wondered what happened to the wounded squirrel. 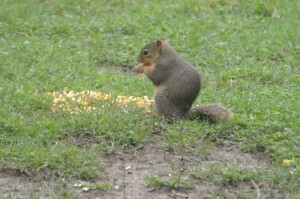 Then on June 1, we looked out in the back yard and the squirrel baby we bravely named Stumpy was eating corn! By June 22, Stumpy had braved the deck and was eating sunflower seeds. Stumpy on the deck eating sunflower seeds. 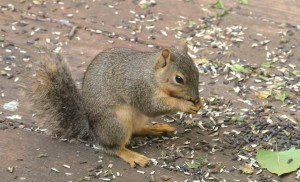 For the last few days, each morning, we wake up at 6:30 to see Stumpy outside on the deck eating seeds. And each morning I see Stumpy, I think of Stumpy’s mom and that tender moment on our deck. A few years back, we got these live traps for trapping mice in our basement, and every now and again we set them. Two weeks ago, we set two live traps and the first night, we captured a mouse whose tail was about half as long as it should be–the tail had been chewed off, perhaps in a narrow escape. Mark released the mouse into the backyard. A few nights later Mark lifted the bar-b-que and inside was a mouse whose tail had been chopped off. We got a plastic cup, pushed the mouse into the cup, lowered mouse and cup to the surface of the deck and the mouse wobbled off. Three nights later–last Sunday–we grilled again and once again, came face to face with a mouse with a chopped off tail. We found it hard to believe there was more than one mouse with a chopped off tail, and since we’d had three encounters with a mouse with a poor strategy for survival, the second time it showed up in the bar-b-que we eased the mouse into the cup and put him in an aquarium. 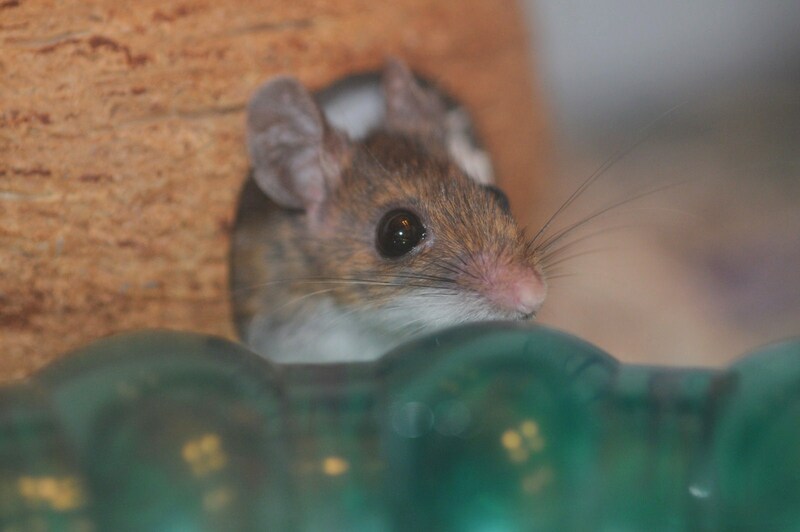 Having raised numerous small rodents over the years, we happen to have in our house a coconut ball for the mouse to hide in, an exercise wheel, some tubing from a hamster cage, a wee dish for food, a water bottle, and in case he was a bit challenged and couldn’t figure out a water bottle, a milk jug cap with water. We added some sunflower seeds and hamster food. 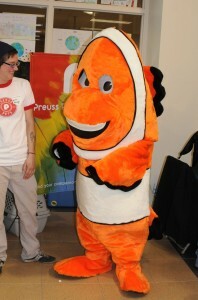 Hours later, Willi, a.k.a. kid #4 called, suggesting Smokey Joe for the name of our mouse. In addition to a shortened tail, Smokey Joe’s right ear was a bit tattered and he had a patch of fur missing on his back. 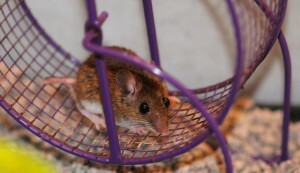 Smokey Joe on his exercise wheel. Smokey Joe immediately adapted to his new surroundings. 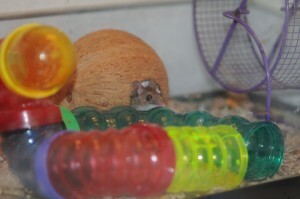 He took up residence in the coconut ball and came out in the evening to eat and to run on the wheel. 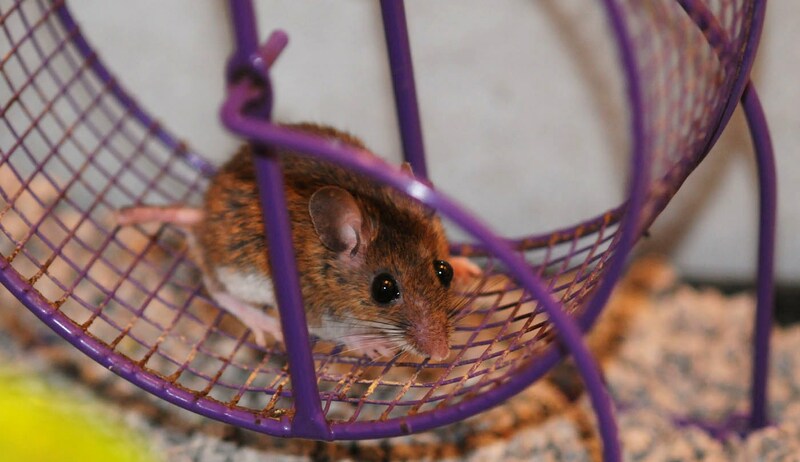 In fact, he not only runs on the wheel like most small rodents, he also stops mid-run sometimes and hangs onto the wheel while momentum takes him around three or four times before the wheel comes to a stop. It is quite fun to see. Smokey Joe also knew what to do with the bits of tissues and made a nice nest for himself inside his coconut. Smokey Joe peeking out from his coconut. We don’t know how old Smokey Joe is, but we figure whatever time he has left he can spend inside our house instead of in a bar-b-que or in the yard. He’s shown he can take some hard licks in the real world and we figure there’s no harm in an old mouse retiring to the life of luxury. Welcome to retirement, Smokey Joe. 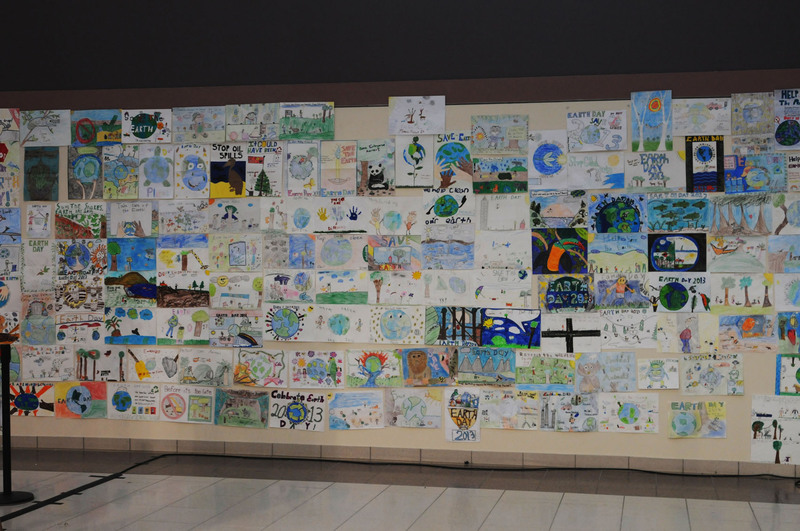 After 25 years working in an environmental program, I have to say that one of the best things I get to see is the annual celebration of Earth Day at my place of work in downtown Lansing. 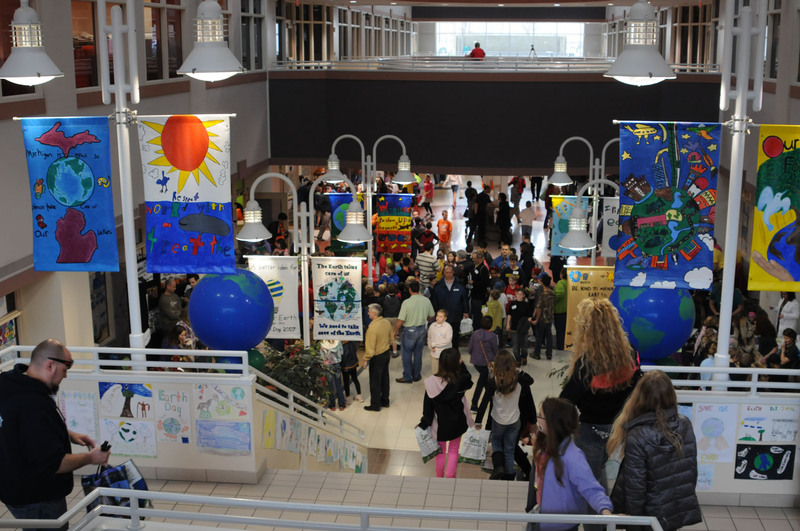 For one day a year, we open the doors and allow kids to come inside to learn about what they can do for the environment. Entrance to my building, with cheery posters. 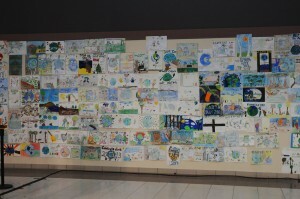 Around the atrium were posters kids made for Earth Day. 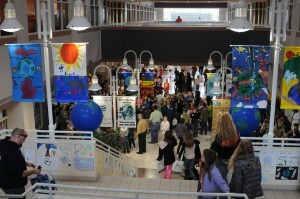 Inside the building were dozens of booths where kids could interact with turtles, frogs, snakes, and other critters. Most of the critters were live except this one. Even Nemo showed up for Earth Day. In one of the conference rooms, kids got to touch a sea lamprey. Some were more excited about this than others. 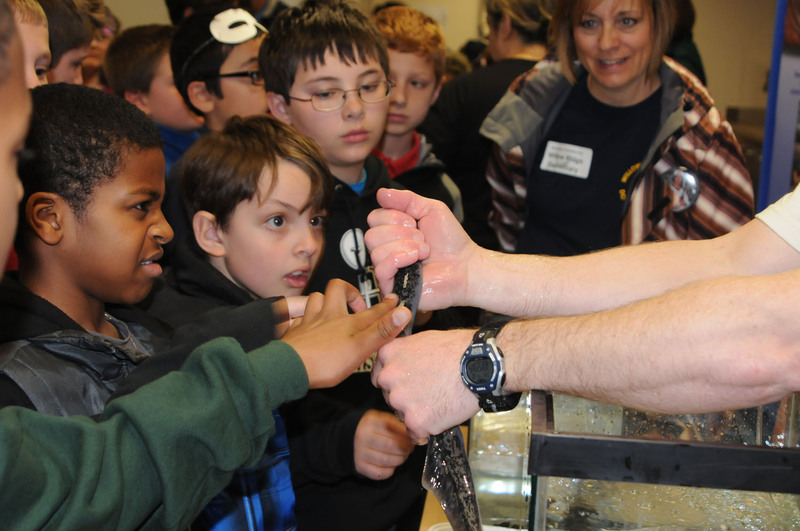 Kids reacting to a sea lamprey. In another room, kids got to hold a parrot or two. Docents from the Potter Park Zoo brought in a variety of critters, including a large snake that spent most of its time coiled around itself, and a tarantula that seemed content just to hang out on a lady’s hand. 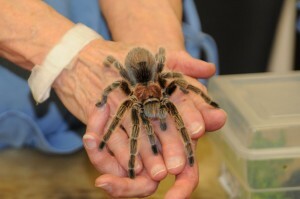 Tarantula posing for a photo. The Potter Park people also brought a blue-tongued skink. 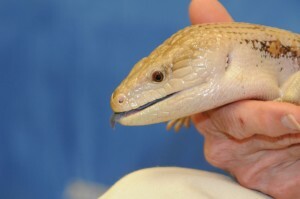 I got to touch the skink. 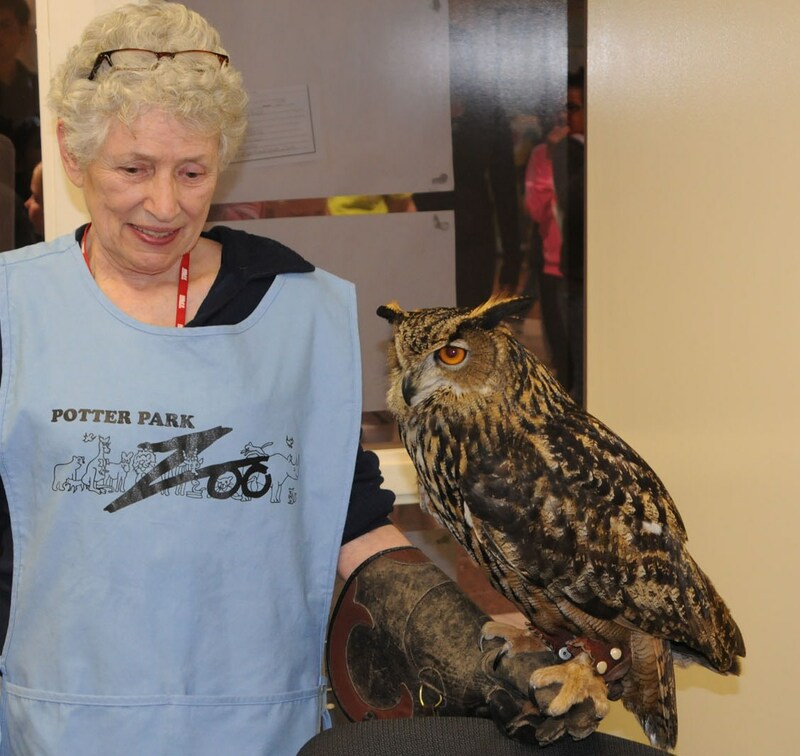 Another nifty creature from Potter Park Zoo was a European eagle owl, which, the nice lady said, is the species of owl seen in Harry Potter movies. 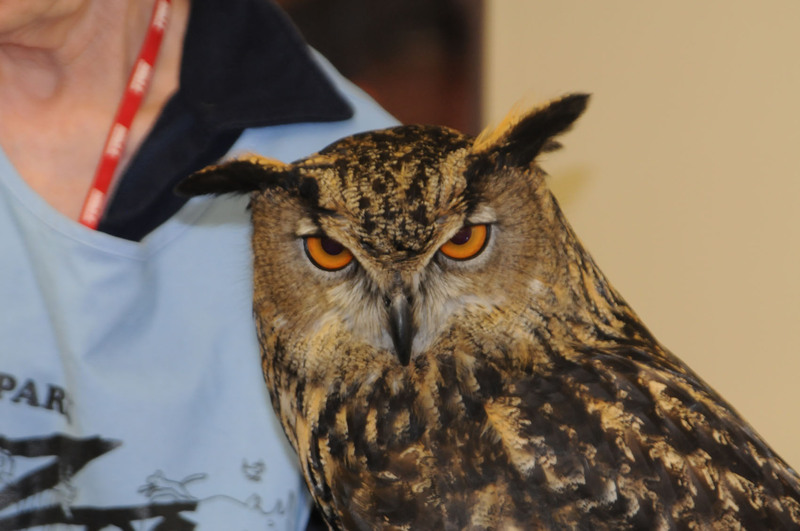 Now, I spent 10 minutes trying to photograph this owl, and most of the time he avoided looking at me. 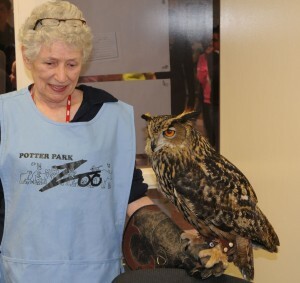 Potter Park docent with her owl pal. Mostly, the owl looked out the window in the opposite direction. This is the only moment he actually looked right at me. Owl finally looking at me. 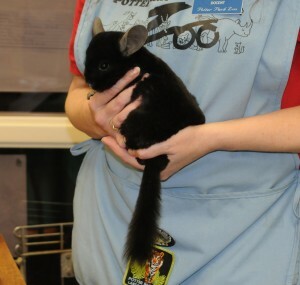 The Zoo folks also brought a black chinchilla. He had really soft fur. I wanted to take him home but the lady said no. Okay, so I’m just like all the other kids that like to interact with critters. But clearly, it’s one of the best things we do each year. I mean, just look at the smiles. Check on Chip–take her out to play? 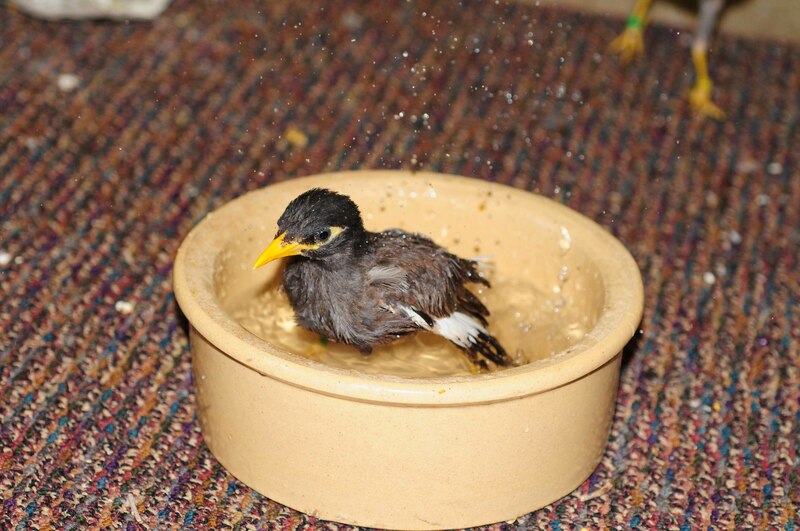 Around 2 p.m. Got to bird room. Shut door behind you. Shut both doors behind you. Around 4 p.m. Return to bird room. Open cage doors. Wait for bird to go in. Shut and lock cage doors. At 6 or 7 Go into bird room. Pull down blankets. Double check all hamster cages. Fill bowls. in balls. Check water bottles. Turn lights on big fish tank. Around 8 or so Feed fish in both fish tanks. Check on Chip; play if not played with earlier. Let Dusty out and back in again. Before 10:00 Let Dusty out and back in again. Oh, and please feed the sea monkeys (brine shrimp) once or twice while we’re gone. And bring in the mail now and again. And the trash goes out on Tuesday mornings. And Dusty would appreciate your shoveling any snow off the front porch. He also likes daily rub-downs and…. Okay, you’ll do fine. 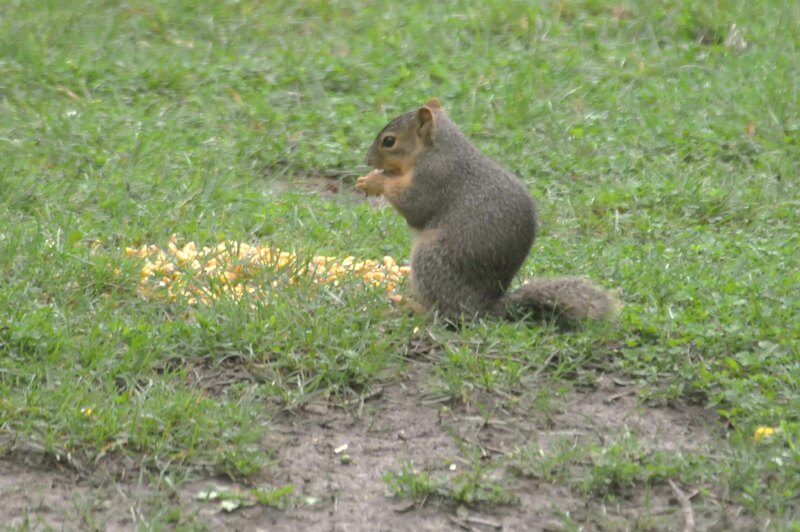 Oh, and about the outdoor critters we feed…. 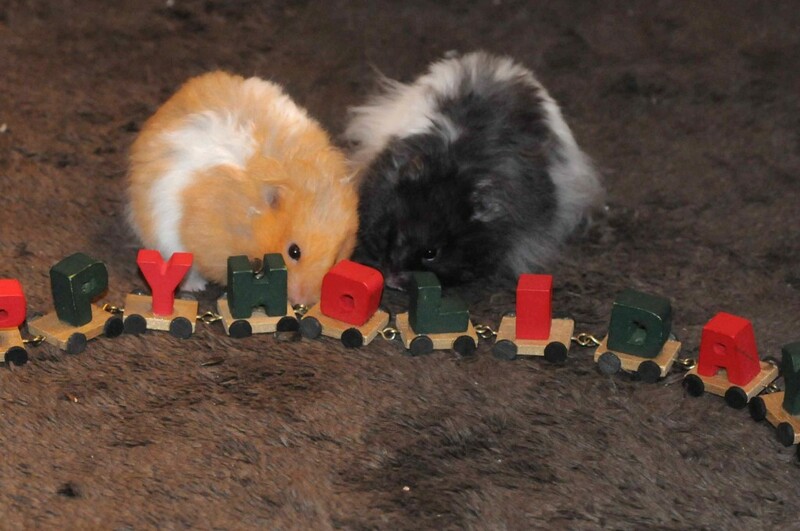 For all pet lovers out there, hampy holidays! 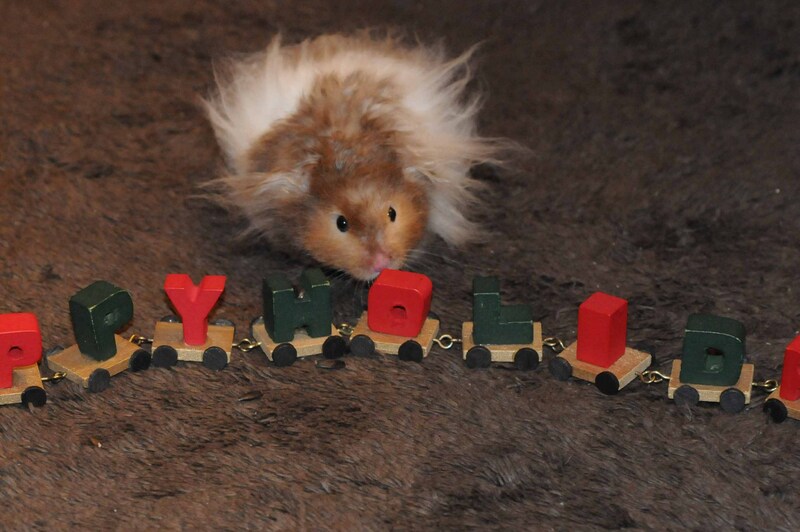 Pumpkin the hamster and our Happy Holidays train. Enjoy yourself and eat lots and lots. 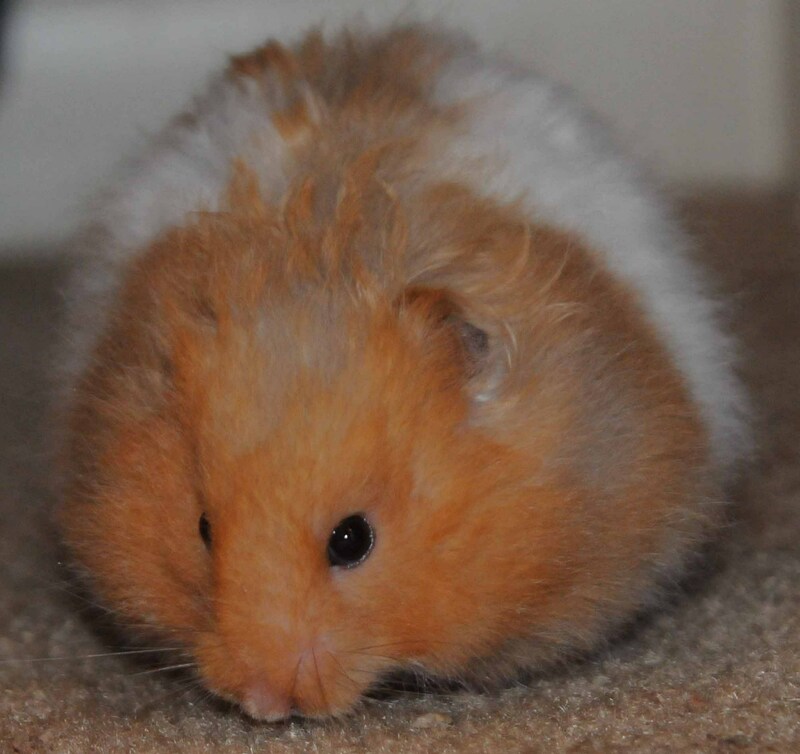 Pumpkin after stuffing her cheeks with pumpkin seeds. And don’t worry about the little things, like how good you might or might not look. Scrinch letting it all hang out. 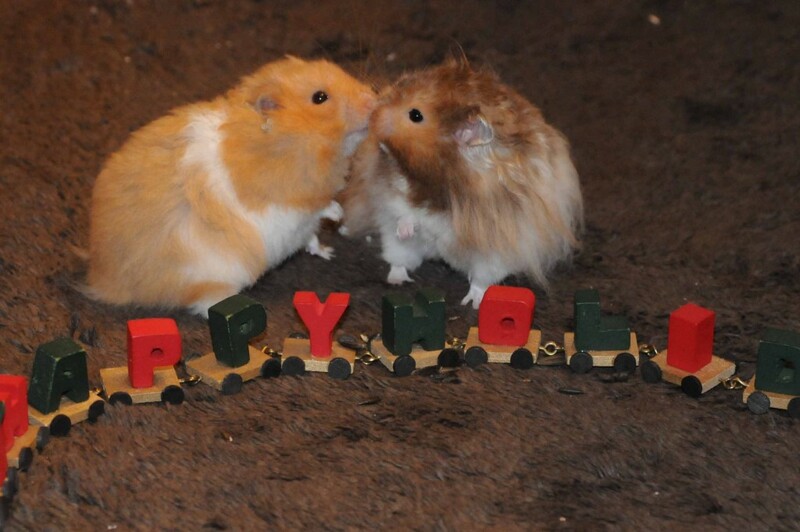 And look forward to 2013 with the enthusiasm of a hampster. The problem with having a good digital SLR camera is that sometimes it needs some TLC. Take mine–it’s a Nikon D300 and had a little dust-spec problem I was tired of trying to crop out of photos, and it needed a new rubber cover to replace the one that should be covering the input/output ports but instead was just flapping around on tiny hinges. With a trip to the Amazon planned a couple of months from now, I wanted to make sure I sent the camera off for its TLC in plenty of time for our big trip. So, two and a half weeks ago I sent my camera off to Nikon. I hadn’t heard from Nikon, so two days ago I called them and learned it will be another week before the new rubber cover comes in. They are THE Nikon repair place listed on Nikon’s official web site and they didn’t have a rubber cover in stock??!! But surely I’m over-reacting, because surely, my old Nikon D100 could fill in for anything exciting that might happen while the D300 was in the shop. And surely nothing exciting would happen in my backyard during the weeks my D300 was away. Surely, I wouldn’t look out my bay window yesterday and see two deer near the lake hiding behind our brush pile, pine trees and tall native grasses, and surely what we first thought looked like a doe and a fawn wouldn’t turn out instead to be a doe and a buck whose antlers blended into the brush pile. And surely the doe wouldn’t come out from behind the vegetation into the open, flick up her white tail and wiggle just so. And surely the buck wouldn’t emerge to reveal his 8-point rack and sniff and mount her. Right in our backyard. I, of course, was clicking away with my Nikon D100, but when I went to download the photos later, only one photo was captured. It’s the one below, which I took when I realized the buck and doe were leaving our property, and ran next door to shoot photos from behind my neighbor’s trees. 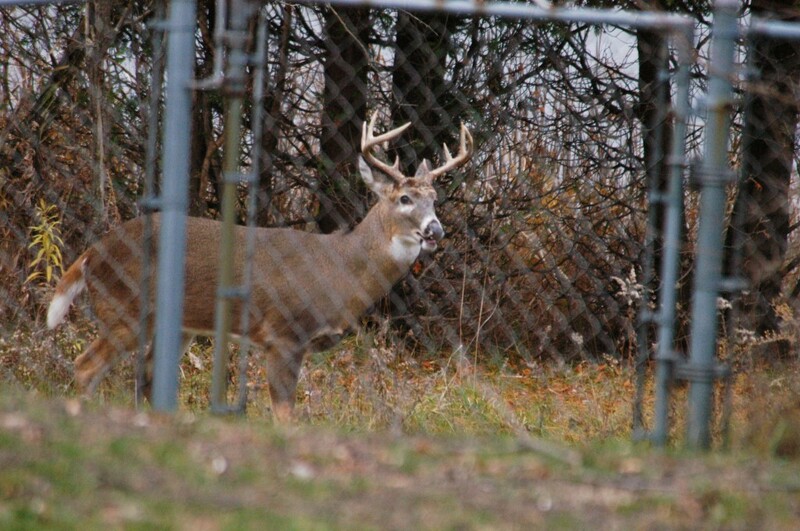 The only photo of the buck that my old camera captured. I don’t know why my old camera didn’t capture the other photos I took. Perhaps in my attempt to snap so many photos, I overwhelmed the old camera somehow. Perhaps the memory card is so new in comparison to the camera, the camera couldn’t translate the information correctly. Perhaps the deer cast aspersions against me for intruding on their private moment. Whatever the reason, it was bad timing on my part to send my D300 off for some TLC. Of course, if I only had bad luck, I would have no buck at all. When it Rains, it Pours . . . Mynah Birds? Mark had no answers then and spent the rest of Tuesday trying to find the little mynah bird. 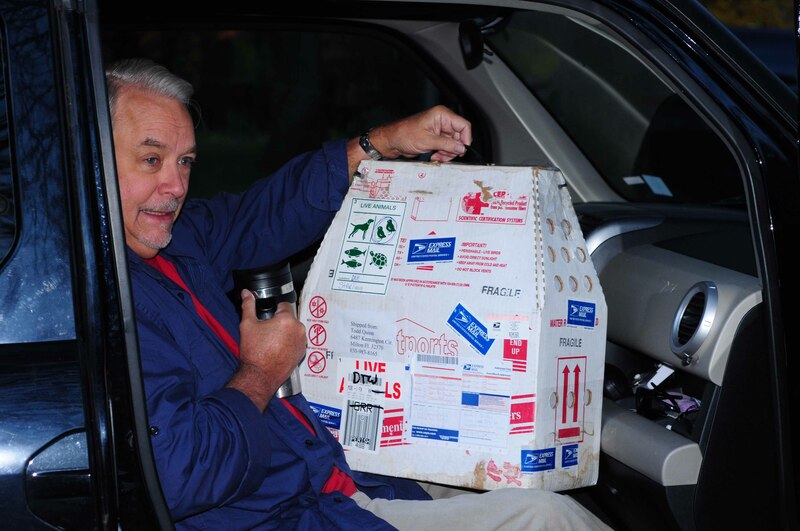 He talked to the Lansing Post Office, the Okemos Post Office, the Haslett Post Office, and to Todd. Even after making a bunch of calls, Mark and Todd could not redirect the bird and send it back to Florida, or to Alabama which is where the bird was supposed to be delivered. 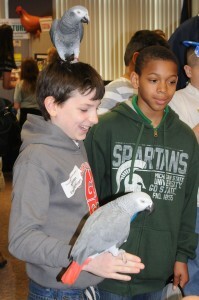 Todd said he felt horrible, because a trip for the bird to Alabama would have been much shorter than a trip to Michigan. 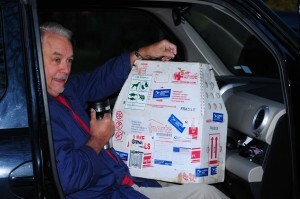 Mark and I waited around our house Tuesday night, hoping the Lansing Post Office folks would call to tell us the bird had arrived. We went to bed wondering if the little bird would survive. 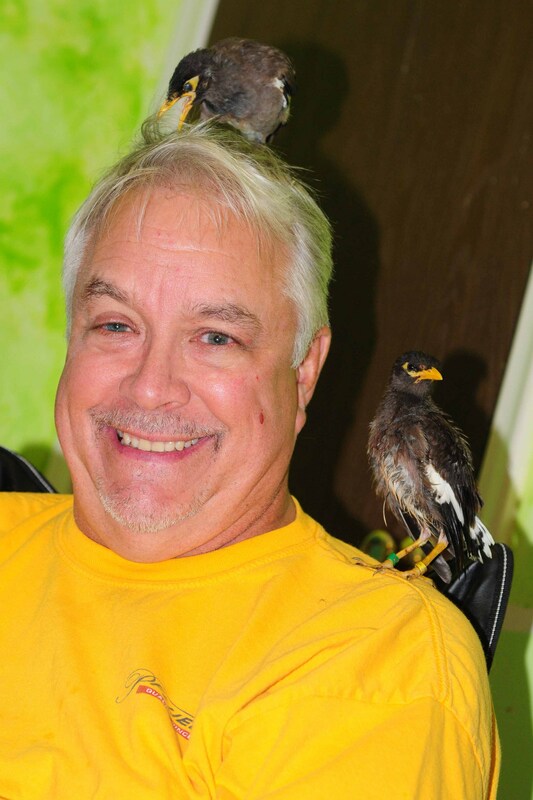 On Wednesday morning, after I got my blood tested, passed out, and was home recovering, Andy, from the Okemos Post, called to tell us the bird had arrived. We asked Andy if he could tell if the bird was alive–it had been in a container, after all, for 38 hours. Andy assured us the box was wiggling. Within 10 minutes, we met Andy. Andy handing Mark the box the mynah bird was shipped in. Mark held the container on his lap all the way home. Mark holding the container on his lap. Once home, we went into Little Buddy’s bedroom. She sat on top of the big flight cage to check things out. Little Buddy checking out the container. 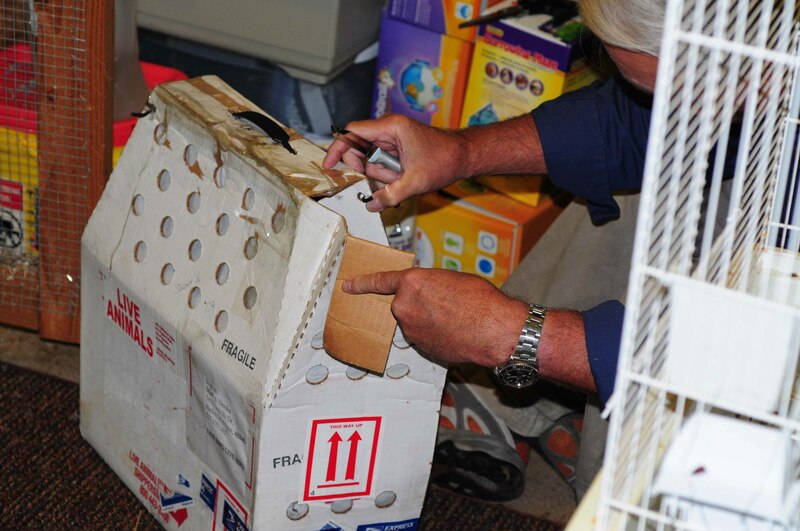 Mark cut open one corner of the strangely-shaped box. . .
. . . and out flew a brown and yellow mynah. The new bird on a hamster cage. 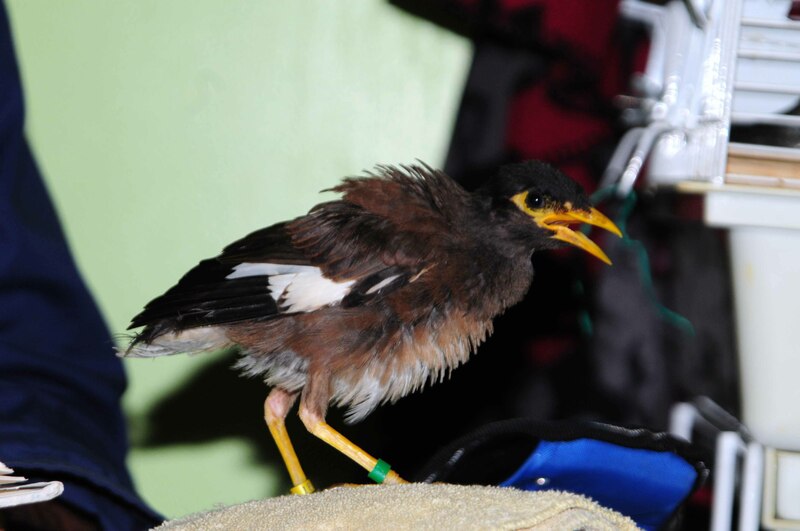 After so many hours in a container with no water and what smelled like some pretty nasty fruit, we thought it best to get the new bird some fresh food and water. 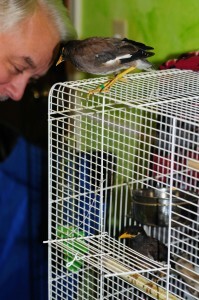 So Mark gently grabbed her and put her in Little Buddy’s cage. Little Buddy came right over to watch the new guy drink big gulps of water and eat. The new bird inside the cage; Little Buddy on top. About ten minutes later, the new bird came to the door of the cage and looked around. 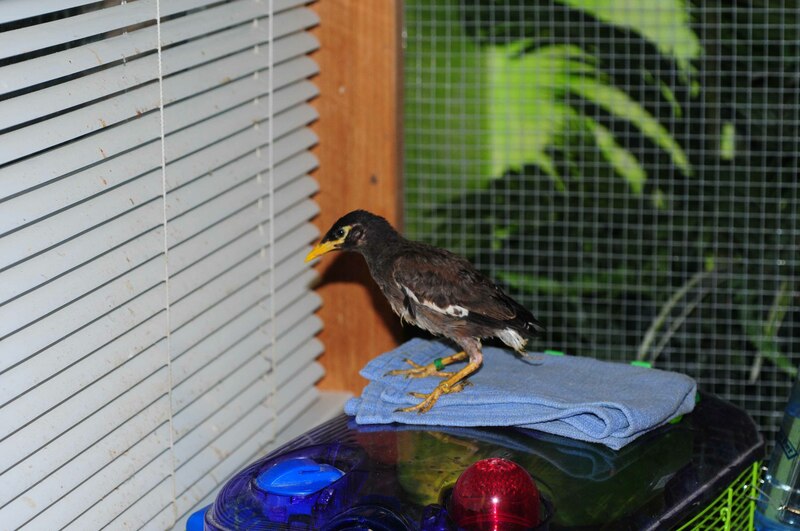 Mark brought over a mynah favorite–a dried mealworm–and caught the attention of both birds. 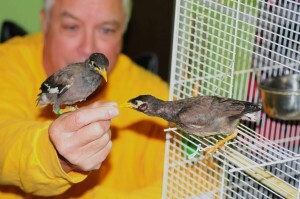 Mark with Little Buddy (on the left) and the new bird (right). Soon the new bird was hopping about the floor. 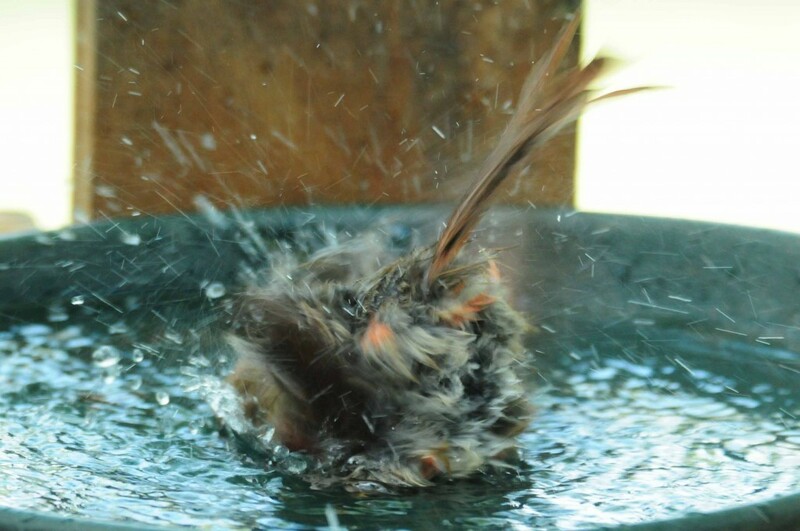 Then she took her first bath. The new bird taking a bath. Now, the thing about this bird is that we weren’t expecting it, because if we had, we’d had asked Todd to sent it by airplane like he did Little Buddy because that was faster and less stressful on the bird. 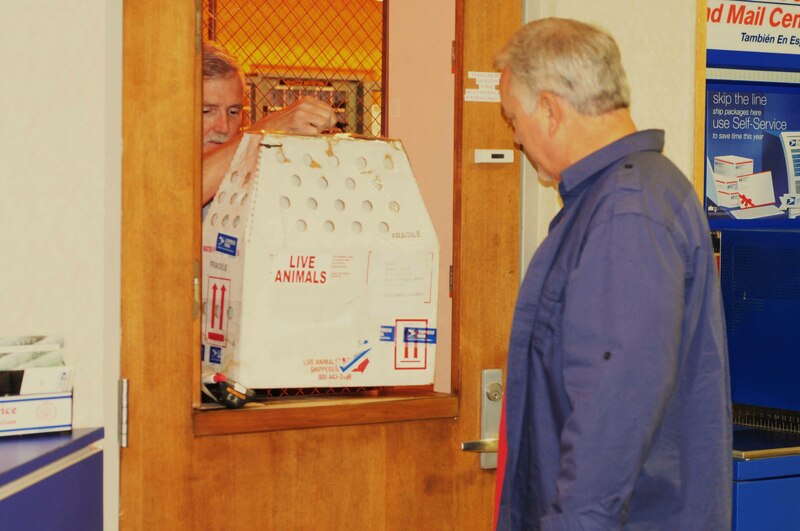 Knowing the new bird had been in a container for 38 hours, we couldn’t bring ourselves to put the little bird back in the container it came in and ship it back to Todd or to the nice folks in Alabama who were expecting it. 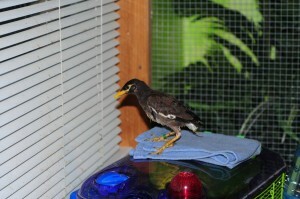 Mark checked with Todd and he said he had another baby mynah he could send to the nice folks in Alabama. We learned they weren’t happy about all this, but we hope they’ll understand that we did what we thought was best for the little bird. 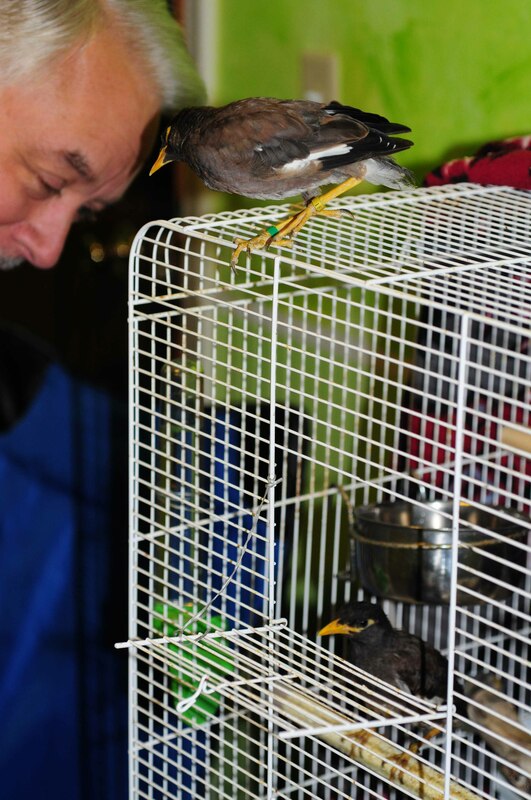 We named the new bird BOGO–Buy One, Get One–in spite of the fact that we sent Todd a check for the little bird, and for its lovely ride inside numerous US Postal Service trucks. Mark with Little Buddy on his head (parting his hair?) and a wet BOGO on his shoulder. 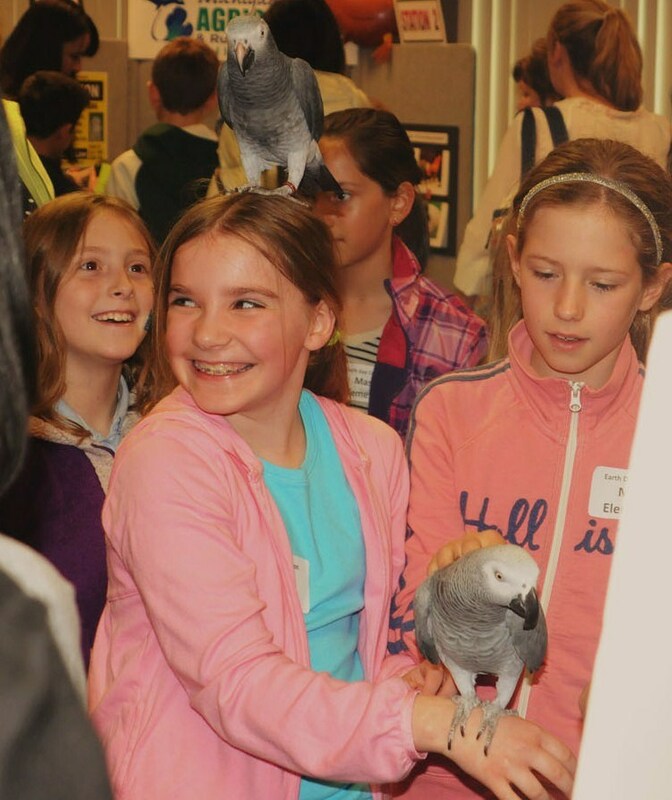 Surely a bird on the head is worth two in the . . . something. This posting is to share a few images from the Great Outdoors taken the last couple of weeks. First, my friend the tussock moth caterpillar. This fella was munching on a milkweed plant. I like its colors, the fact that it looks sort of like a fly I’d use to try to catch a trout, and also because word tussock is the only word I’ve found that sort of rhymes with buttock. This fella made himself comfortable in a red cup attached to a pole under our bird feeder. 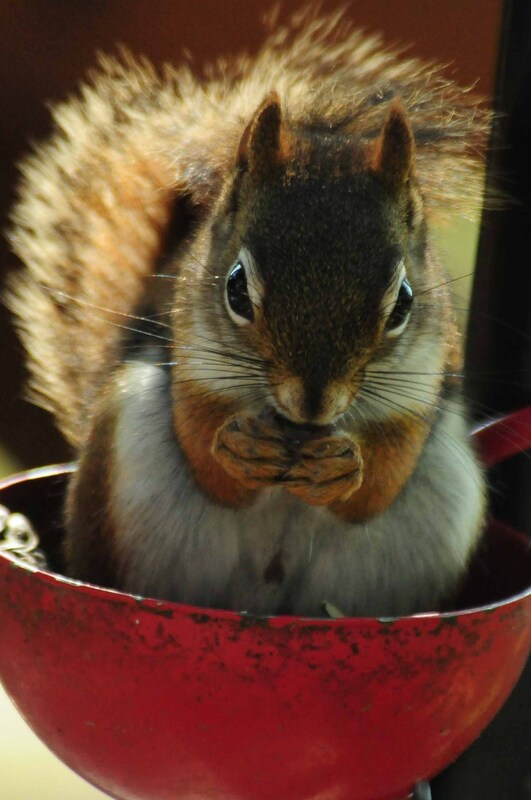 Red squirrel in a cup eating sunflower seeds. 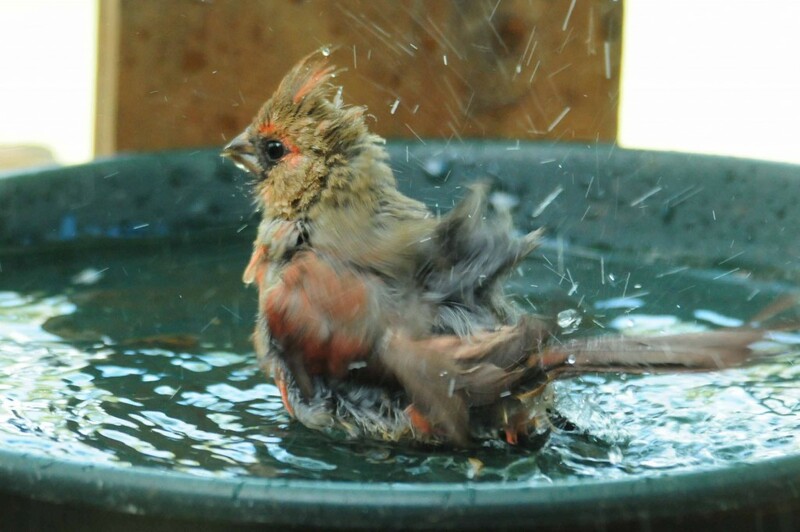 This is a baby cardinal taking a bath in our water dish. She was apparently quite dirty and spent a fair amount of time correcting that problem. I took several photos including this one where her head is turned sideways. A few days ago, I found this unfortunate moth outside in my front yard. I usually don’t pick up dead things, but thought it was cute. So, I, took it inside for a photo or too. On our kitchen table, of course. Moth on my kitchen table. LeptoMan, a moth/butterfly guy at work, identified this as an underwing moth (Catocala relicta) that hangs out on birch trees. We don’t have a birch tree, but our neighbor does, which means it’s all my neighbor’s fault that the moth died, I’m sure. 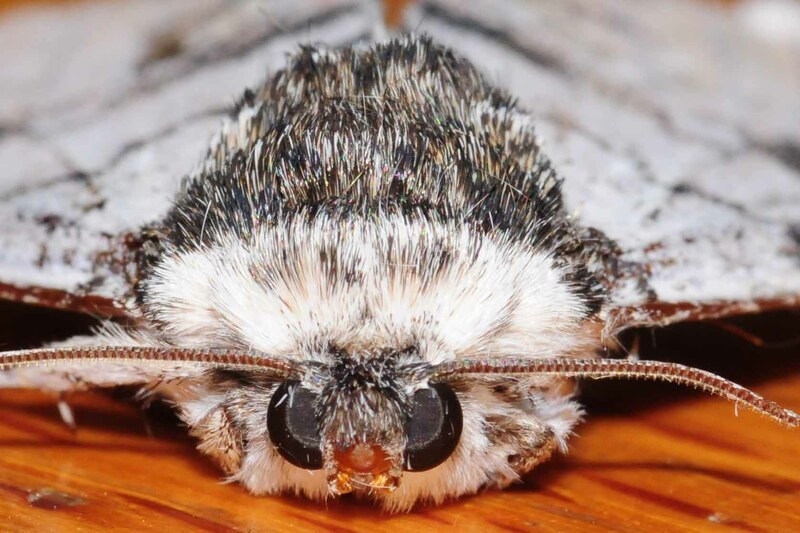 Luckily, as I had hoped, my moth friend had a really cute face. It’s one reason I like moths. Close-up of my moth pal. And then I ate the moth because I wanted to know what it tasted like. Not really. 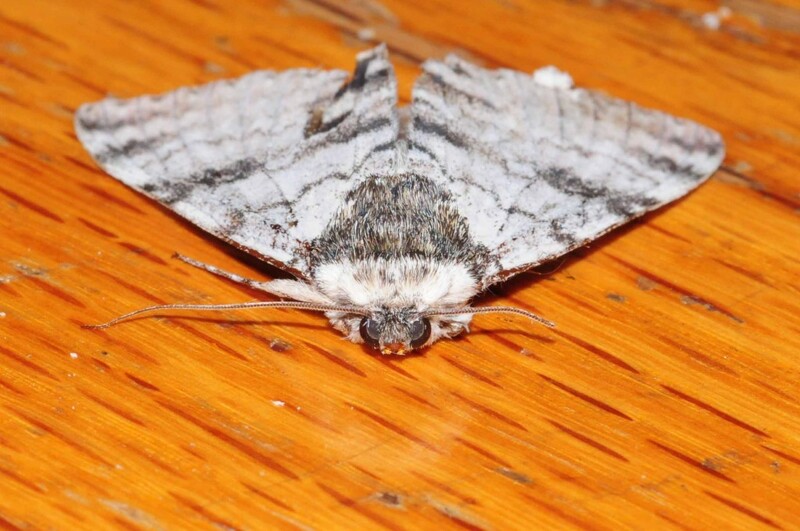 I took the moth back outside, said, “God bless the fuzzy moth,” and buried it. I also wiped the table off. So there you have it. A few critters from the Great Outdoors. 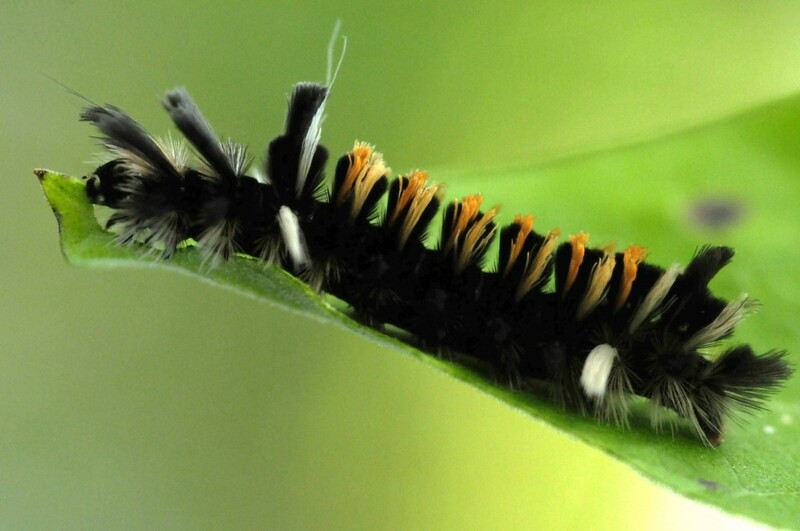 Some, like the caterpillars and moths, will be pretty scarce soon, so get outside NOW before it sNOWs. 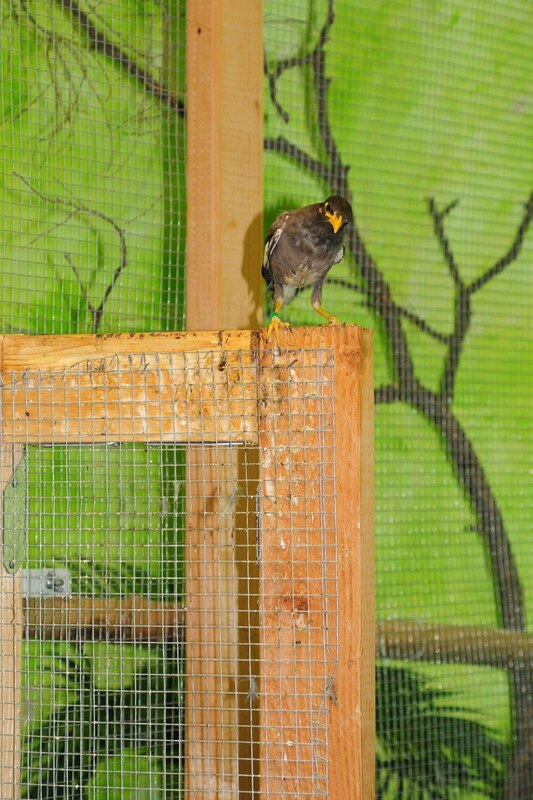 It took Little Buddy a little over a week to get out and safely back in her cage by herself, and one thing that helped her along was putting a yellow washcloth on the door of the cage to give it a firmer feel. Once she figured out the yellow wash cloth was safe to land on, we moved the wash cloth onto Mark’ s leg. Little Buddy on the yellow wash cloth on Mark's leg. Well, once Little Buddy was comfortable on Mark’s leg, she started checking out the book he was reading. 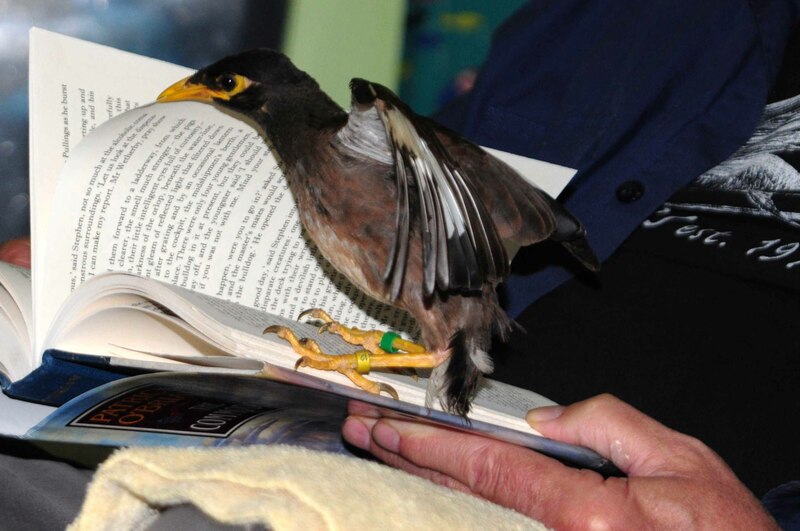 Little Buddy checking out Mark's book. She found his book about 18th Century navy life to be fascinating. Little Buddy reading along with Mark. Little Buddy quickly moved right on to the next page. 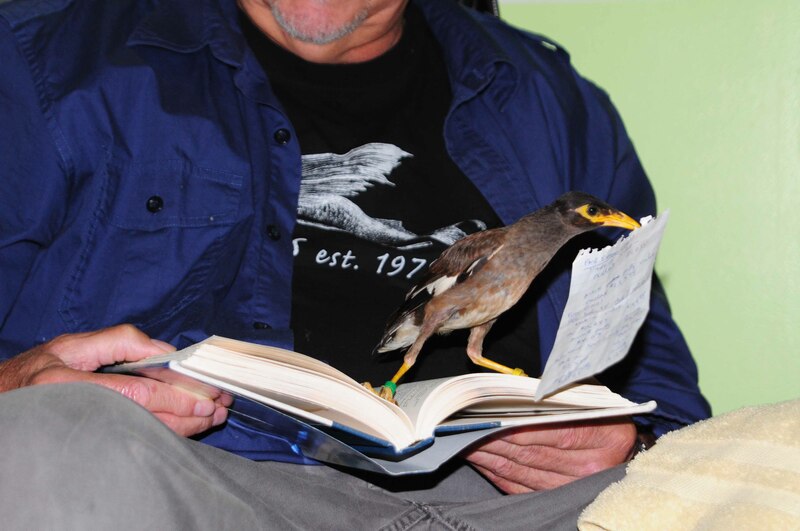 Little Buddy reading faster than Mark. She even helped Mark turn the pages. Little Buddy helping turn the page. 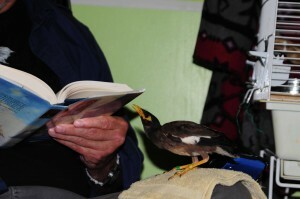 She soon grew impatient with the pace of Mark’s reading. 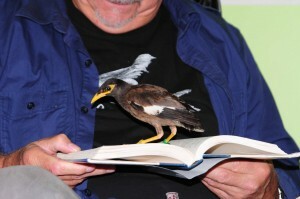 Little Buddy grabbing Mark's book mark. 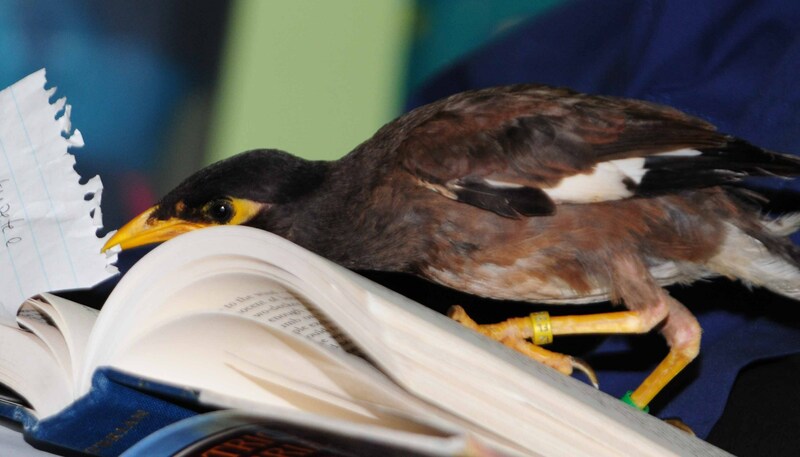 Then she walked off with Mark’s book mark and, with a clumsy flutter of her wings, almost got the book mark inside her cage. Little Buddy walking off with the book mark. 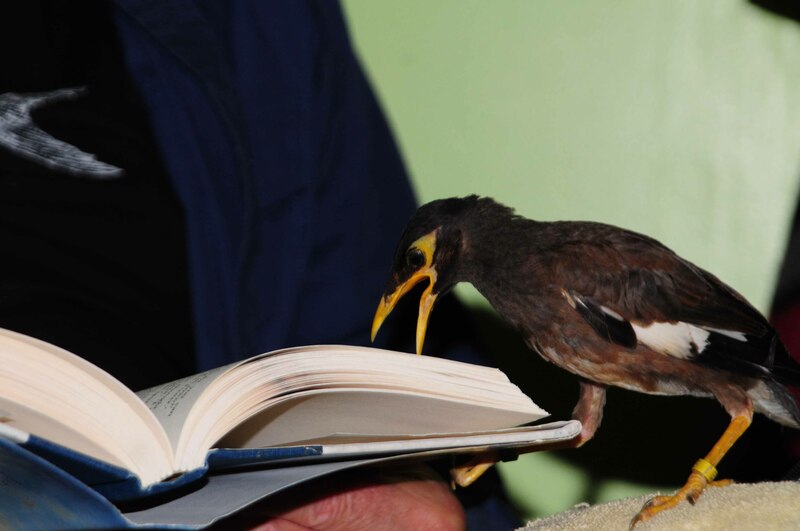 In truth, our mynah bird can’t read books. And Mark hasn’t gotten much reading done in her company, either. But Mark is sure having a good time with his curious Little Buddy. Oh, if any of you are looking for a mynah bird of your own, you need look no further than Todd from Milton, Florida. 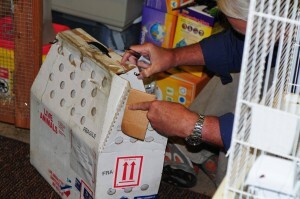 It’s where Little Buddy came from, and we hear he has a couple more baby mynahs looking for new homes. 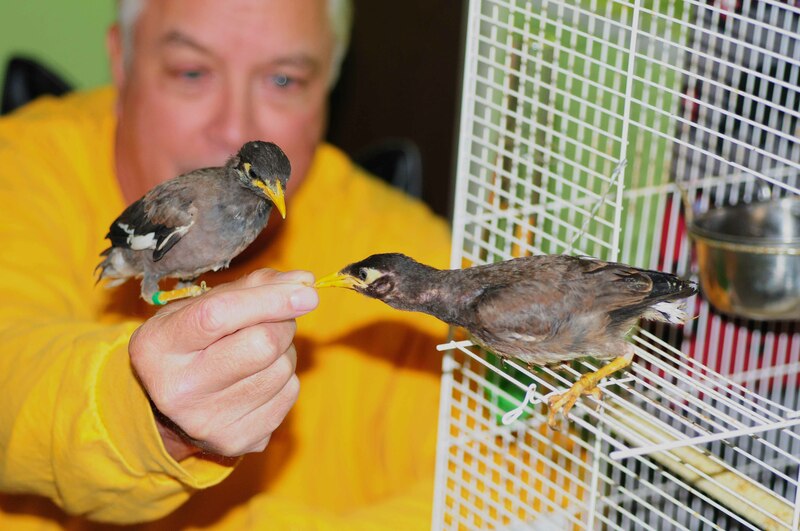 Todd loves his birds and he’s called a couple of times to check on Little Buddy and make sure she’s doing whatever mynahs are supposed to do. Or maybe he’s checking on Mark to make sure Mark’s doing what mynahs like Marks to do. Hm.